Every so often, I experience a flash of epiphany and then wonder why I’ve never thought of that idea before. This is a riff on prosciutto with melon and/or figs. It works, in spades. The grapes were tossed with olive oil and sea salt, then roasted at 400 F for 15 minutes. The pancetta is just thinly sliced pancetta that was chopped, then fried until crispy over medium heat, then seasoned with parsley, salt and pepper. Time: About 25 minutes, including prep. I’ll be making this again — next time, with pancetta that’s been sliced just a little thicker. 06 Mar	This entry was published on March 6, 2012 at 3:12 am. 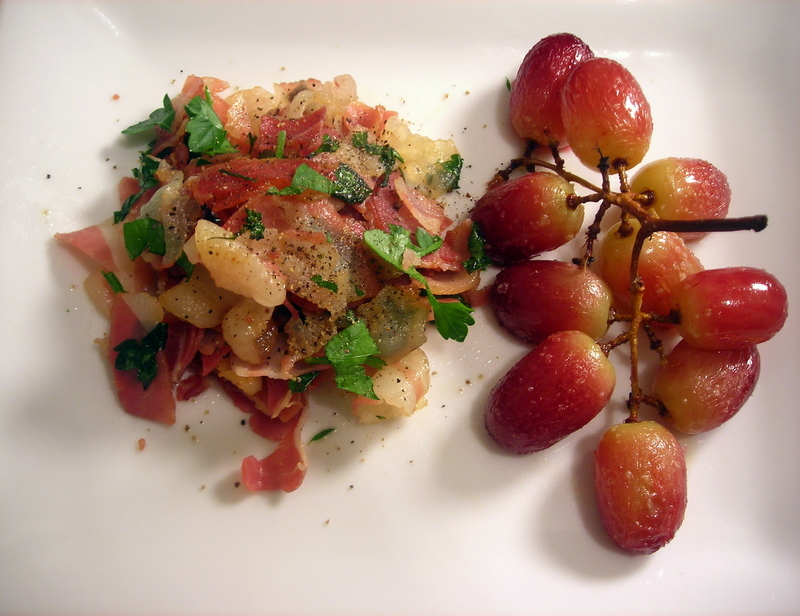 It’s filed under food, Italian food and tagged appetizer, food photography, gluten-free, grapes, pancetta. Bookmark the permalink. Follow any comments here with the RSS feed for this post.